Now that you have your front matter files done, it’s time to work on your chapter files. 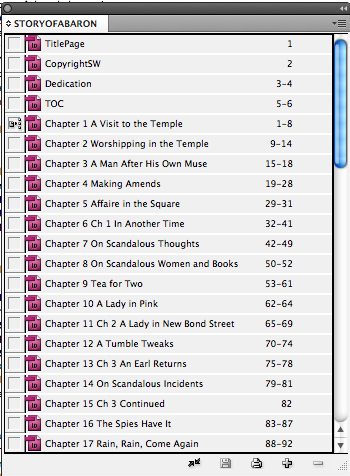 You’ll need a separate InDesign file for each chapter and, if applicable, a prelude and epilogue. 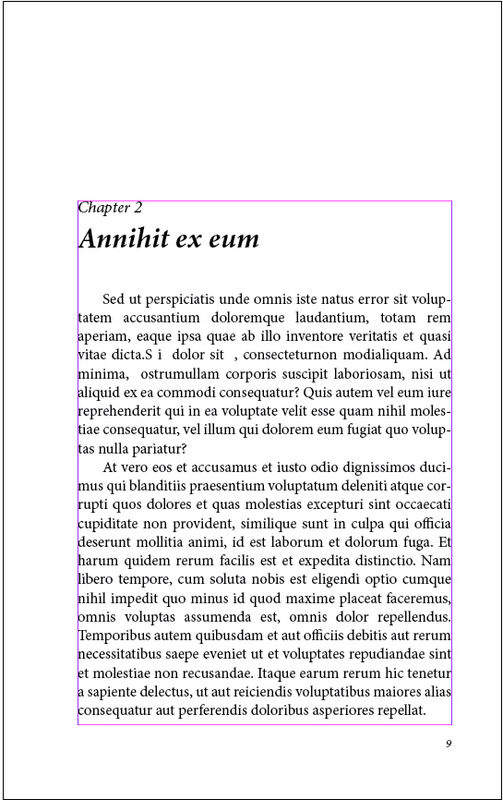 These will use the book template you set up earlier, which includes the master pages appropriate for chapter files. Choose File > New > Document. Select the preset template you set up earlier. Choose File > Save As and give it a logical filename without spaces (such as Chapter1.indd). Apply master page B. Additional pages will have the master page A automagically applied as content is added. Adjust the text block to start ~ 2 inches from the top margin. Choose Window > Paragraph Styles. From the Paragraph Styles palette (click the upper right corner), select New Paragraph Style. The first style will be the one applied to your chapter headings, such as “Chapter 1”. When converting the book for Kindle and ePub files, this style will break up the. xml into separate files and create the entries in the online table of contents. Assign “Style Name” to be h1 and the “Next Style” to be “Title”. 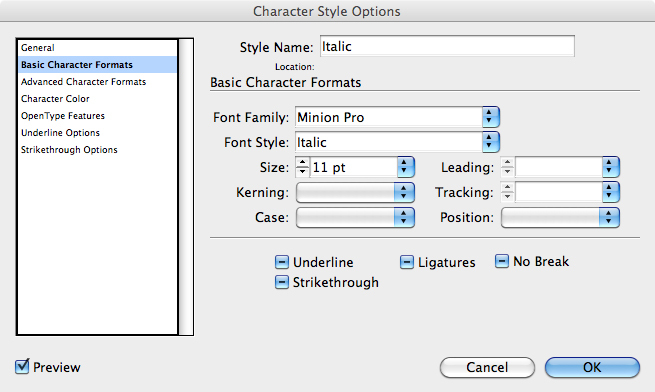 Select “Basic Character Formats” and choose your Font Family and Size and Leading. Typically, these appear bold or italic or both and are sized differently from the text in a book. Select “Indents and Spacing” and set the Alignment to Left Justify. Include an extra line space below the h1. Repeat steps 5 through 11 to create a chapter Title style (if applicable – you may not use titles for your chapters). Set the “Next Style” to be Note Text. Repeat steps 5 through 11 to create a Note Text style, the subtitle line where you might indicate the date or location where the chapter takes place. This is usually shown in italics, so be sure to set your “Basic Character Formats” to your Font Family and choose the italic version of the font. Set the “Next Style” to be Body. Repeat steps 5 through 11 to create a Body style with the “Next Style” to be Body. The majority of your manuscript will use this style, so be sure to set your “Basic Character Formats” appropriately and give your line spacing some “air”. Choose Window > Character Styles. From the Character Styles palette (click the upper right corner), select New Character Style. The only character style you should need in a novel is one that indicates emphasis, a character’s thoughts, or foreign language words and phrases. This is typically the italicized version of your main “Font Family”. Assign “Style Name” to be Italic. Select “Basic Character Formats” and choose your Font Family (be sure to select the italicized version of the font) and Size and Leading. Choose File > Save As and give it the filename Chapter2.indd. Repeat step 21 for as many chapters as there are in your book. Enter your h1 (Chapter 1, for example) and hit Return. With your cursor at the end of the line, apply the h1 paragraph style by clicking on it in the Paragraph Styles palette. In the next line, enter your chapter title (if applicable) and hit Return. The paragraph style Title should already be applied to the line. If not (because you may not have filled out the “Next Style” in the h1 definition), apply the Title paragraph style. 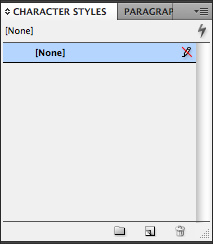 Choose File > Place and select the corresponding RTF file for the chapter. Click your loaded cursor in the Body line space and your text will autoflow into the file. Extra pages will automagically be created as the text populates the file, although occasionally you may have to choose Layout > Page > Add Page to get the process started. Click the red + at the bottom right corner of the text box to load the cursor and then click in the upper left corner of the next page’s margin to “place” the text and continue the flow. OR, just copy and paste your text into the chapter files.c Return and apply the Body paragraph style. Apply paragraph tags and character tags as appropriate. Name the bookfile using the title of your book and save it in the same folder as your chapter files. Click the + at the bottom to add a file. Start with the file TitlePage.indd. Continue to add files until all are included. Click and drag the files up or down to rearrange them within the bookfile. From the bookfile palette menu (upper right corner), choose Save Book. In the next post, we’ll cover how to create and add your back matter to your book, including the introduction to an excerpt from your next book, the excerpt, links to your other books and an “about the author” section.